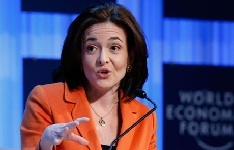 Hyderabad: India not only has the world's second largest Facebook user-base with over 100 million people connecting with family and friends, but as many as 9 lakh SMBs are also leveraging the platform to reach out to customers, its COO Sheryl Sandberg said today. "We have 900,000 active small business pages in India. This is just amazing.... Connecting people and small businesses," Sandberg, who has also served as Vice President of Global Online Sales and Operations at Google, told PTI. As India turns more digitally savvy and social media is now a part of daily life, the user has become the centre of all interactions. Facebook with its huge connect is the prefect platform to take forward the growth story of small and medium businesses (SMBs), Sandberg added. Of the over 100 million users in India, around 84 million users access the California-headquartered social networking site from their mobile devices. Increasingly, consumers are using social media to get feedback on products and services (that others may have used) and small business can leverage the Internet by exploiting its participatory nature, she said. "Facebook is the communication to grow economies and we are pretty important in growing small businesses. Facebook is interested in the intersection of the Internet, the people and the government and wants to work on bringing a billion people in India online," Sandberg said. She was of the opinion that the platform will the "most potent answer to the needs of SMBs", where they can reach out to a huge number of consumers in a cost-effective way and at the same time strike a more personal bond with them. Sandberg, who has also served as an economist with the World Bank, stressed that SMBs are the answer to a country's fight to grow its economy and providing better products and services to its citizens. As per government data, micro, small and medium enterprises (MSMEs) contribute nearly eight per cent of the country's GDP, 45 per cent of the manufacturing output and 40 per cent of the exports. As of 2010-11, India had about 311.52 lakh MSMEs, providing employment to around 732.17 lakh with a fixed investment of Rs 7.74 lakh crore and production worth about Rs 10.96 lakh crore.